Today I was able to enjoy the awesome weather (almost 60 degrees) and got in a run after work before it got dark. Even better, I ran in my new VFFs. VFF is short for Vibram Five Fingers. They are a new (at least to me) type of minimal shoe. They have been popularized by the Barefoot Running movement and a book entitled Born to Run by Christopher McDougall. I just bought the book on Amazon Kindle for iPhone. It looks really interesting. I have the KSO Treks, which are a bit pricey ($125). They have others that are less expensive, but the store I got them from had a hard time keeping VFF’s in stock, and they had the KSO Treks in my size, so I got ‘em. They say you are supposed to ease into using them, starting off with a mile or two, and working up from there. The reason is that you use a lot more of your “stabilization muscles) (my non-technical term), and if the muscles aren’t used to it, you could hurt yourself. This is similar to the difference between going to the gym and using free weights vs. machines. You also have to run with a different foot strike. Most people in the US wear running shoes with a big clunky heel, and they are encouraged to strike the ground with the heel first. Before modern running shoes, everyone ran with the mid or forefoot striking the ground first, using the natural shock-absorbing properties of the foot. I have been working on this foot strike off and on for years, so i am somewhat used to it. My first run was on streets around my house, and on frozen ground in a grassy park near my house. 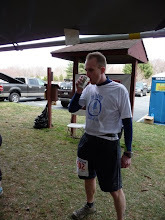 My second run, weeks later, was today at Patapsco State Park. Rather than just running a mile or two, I ran about 5ish miles. It is fairly technical terrain over dirt single-track trails. I couldn’t just run a mile. I was rushing to get my run in before it got dark, so I decided to do the whole thing in the VFFs. I really enjoyed it. I always enjoy running, but it was really cool trying out a new way to run. With my old shoes, I would typically try to hop from rock to rock or log when crossing streams, because wet feet get heavy and slow me down. With the VFF’s, I didn’t feel that need, as sloshing through streams didn’t weigh my feet down. But then I tried hopping from rock to rock, and was amazed at how much control and traction I have. I guess it’s like wearing climbing shoes. So I would alternate, depending on how I felt. My KSO Treks have trail nubbies on the soles to supposedly provide extra traction. I’m not sure if they really do or not. I’d have to try a model of VFFs with the standard sole to compare. I found that my toes provided great traction in the mud, soft earth, snow, and gravel. Well, pretty much everything. Now that I’m done the run, I can tell that my calves got a super workout. They felt pretty much the same way after the Ugly Mudder 2 weekends ago, in the deep snow. On that day, I wore my Inov-8 Trail Shoes. (I don’t know the model.) The Inov-8s are known for having a low heel for increased handling on trails. If you aren’t ready for the almost barefoot experience, I suggest you give them a try. You can work on your midfoot technique and enjoy a mixture of the benefits of barefoot and shoe running. It is difficult to adopt a midfoot foot strike with most conventional shoes. The heel is so thick and raised, it makes it difficult to do it properly. I should probably include more information on foot strike techniques, but this post is already long enough. I’ve been reading about it for years, and I have a couple books to recommend and even a DVD. I’m sure there is stuff on Youtube also. One additional observation: running in the snow and cold winter streams can be a bit cold for your feet if the toes are separated. This is especially true if you are doing a long run and going to be in the elements for hours. Vibram makes a Five Fingers model with a neoprene upper, called the Flow. It’s like a wetsuit for your foot. I don’t know how it would be, but if I was going to do a lot of snow running, I would strongly consider getting them. Actually, that’s the kind I was going to get, but the store did not have them in my size. Good to hear you're enjoying your KSO Treks so much. I hadn't realized it, but I'm guessing there are a number of new VFF wearers who went straight to the Trek for no other reason than it was the only model in stock. The demand for Five Fingers is just crazy. Regarding one of your questions, the KSO Trek sole definitely provides more traction than the standard KSO sole -- you have a lot more traction on muddy terrain, for example, or if you're bounding up a steep incline. You know, in addition to VFFs forcing you to change your gait and requiring muscle rehab, I'm guessing they also cause the bones in your feet to get stronger, but this is purely speculation on my part. Bottom line is that it just takes a long long time to adjust to running in Five Fingers (or barefoot for that matter) for many reasons. thanks, Justin. I was checking out your blog earlier. a lot of good info. The vffs strengthen the muscles and ligaments and tendons in the feet. I'm finding that switching between wearing them for running, walking barefoot at home, and wearing conventional shoes at work is difficult. I'm going to need to get some minimal shoes for work. They tend to be so expensive though, even though there is no technology in them. They should be ultra cheap. They are so simple, I might just try to make my own.